Charmy cottages and apartments with capacity for couples, families or groups located in Rascafría, the heart of “Sierra de Guadarrama National Park” in Madrid. Rascafría is a beautiful, peaceful town in the northwestern area of the Madrid region, located in a very interesting rural and environmental area; actually it is probably the most attractive place in all of Madrid´s mountain range. This village has all the facilities that you could need (restaurants and bars, national health clinic…) and only 92 Kms away from Madrid city. Nature is undoubtedly the main attraction of El Valle de El Paular and Rascafría, but also the quiet, mountain scenery, wide range of activities (mountain trails and routes, sports, skiing, cultural tours…) and proximity to the province of Segovia make it an ideal destination any time of year. CALDERUELAS: romantic and VIP accommodation for couples - Bright lounge/dining with great views to the mountains from 2 balconies. - Fireplace. - Fully equipped open plan kitchen. - Bathroom. - 1 master bedroom decorated in a romantic style with king size 4 posted bed. - High ceilings covered in pinewood and attic windows. NAJARRA: original apartment with fireplace for 2 pax - This accommodation is built on two levels (duplex style); master bedroom is overlooking the lounge from a balcony and connected by a staircase. - High ceilings covered in pinewood and attic window over the bed where to enjoy stars watching at night. - Large lounge/dining with fireplace and fully equipped open plan kitchen. - Big bathroom. AGUILÓN: charming apartment for 2 or 4 pax in Rascafría - Lounge/dining with great views to the mountains from 2 balconies. - Fireplace. - Fully equipped open plan kitchen. - Bathroom. - 1 master bedroom. - Pull out double sofa bed in living area (to get 4 pax). ÁLAMO: 160 age charming cottage in Rascafría - This cottage was restored keeping its original structure and materials, as it was built almost two centuries ago. - Friendly lounge/dining with fireplace and fully equipped open plan kitchen. - 2 bedrooms: one master bedroom and one double bedroom - Bathroom. REVENTÓN: original dúplex for 4 Pax in Rascafría - Bright lounge/dining with fireplace and fully equipped open plan kitchen. - 2 balconies, one of them with a view to the famous Peñalara´s Peak. - 2 bedrooms: one master bedroom and one double bedroom. This accommodation is built on two levels; double bedroom is overlooking the lounge from a balcony and connected by a spiral staircase. - Bathroom. - High ceilings covered in pinewood and attic windows. 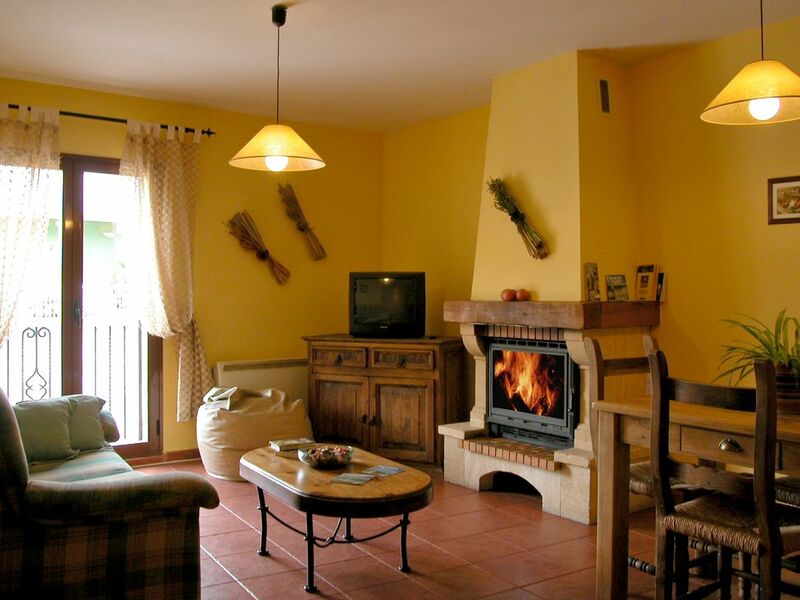 Angostura (4 Pax): apartment with fireplace in Rascafría - 2 bedrooms: one master bedroom and one double bedroom decorated in a traditional country style. - Lounge/dining with fireplace and fully equipped open plan kitchen. - Bathroom. CANCHAL (4-6 Pax):a cottage to enjoy the peace of Valle del Paular - Porch and private little garden with views to the mountains and Rascafría´s river. - Barbecue. - The building doesn´t have any stairs so it is a recommendable accommodation for either kids or elderly people. - Lounge/dining with fireplace and fully equipped open plan kitchen. - Bathroom. - 2 bedrooms: one master bedroom and one double bedroom decorated in a traditional country style. - Pull out double sofa bed in living area. - Location: in Rascafría´s residential area, in front of the river. UMBRÍA (4-6 Pax): cottage to enjoy the beauty of Valle del Paular - 2 big balconies with great views to the mountains - Little garden with barbecue - Large lounge/dining with fireplace and fully equipped open plan kitchen. - Bathroom. - 2 bedrooms: one master bedroom and one double bedroom. - Pull out double sofa bed in living area. - Location: in Rascafría´s residential area, close to the river. MALAGOSTO: beautiful dúplex for 6 Pax in Rascafría - Original lounge/dining with fireplace and fully equipped open plan kitchen. - 2 bathrooms. - 3 bedrooms: one master bedroom and two double bedrooms. This accommodation is built in two levels (duplex style), one of the double bedrooms is overlooking the lounge from a balcony and connected by a spiral staircase. - 2 balconies, high ceilings covered in pinewood and attic windows. - Location: inside village of Rascafría (Madrid´s Mountains range) GARCISANCHO: large apartment for 6 to 8 Pax in Rascafría - Large lounge/dining with fireplace and fully equipped open plan kitchen. - 2 bathrooms. - 3 bedrooms: one master bedroom and two double bedrooms. - Pull out double sofa bed in living area (to get 8 pax). - Location: inside village of Rascafría (Madrid´s Mountains range) Service available: - Free internet wi-fi access. - Free DVD on request.